The Trump administration’s efforts to reform US wetlands policy are a century or more out of date. All the same, wetlands protection would benefit from a clearer policy foundation. In June 2018, President Trump issued an executive order, “Restoring the Rule of Law, Federalism, and Economic Growth by Reviewing the ‘Waters of the United States’ Rule,” that directed the Environmental Protection Agency (EPA) and the US Army Corps of Engineers to review and rescind an Obama-era rule defining “navigable waters” under the Clean Water Act. Acting on this executive order, EPA and the Corps have proposed a new definition of “Waters of the United States” (WOTUS) that would include traditional navigable waters, tributaries to these waters, certain lakes and ponds, and wetlands immediately adjacent to jurisdictional waters. This definition constitutes a significant reduction in scope of the government’s regulatory domain, which has also included intermittent streams, prairie potholes, wet meadows, mudflats, sandflats, sloughs, playa lakes, and other wetland features. The proposed WOTUS Rule also marks a reversal of a century of effort to bring science’s evolving understanding of wetlands into line with government’s authority for protecting and improving the nation’s environmental quality. Not surprisingly, then, the rule has been met by resistance on the part of environmental advocacy groups and members of the wetland and conservation science communities. But the significance and impact of the rule change can be understood only in the broader context of how US wetland policy has evolved along with shifts in cultural outlook, economic imperatives and opportunities, and relevant scientific and technological developments over the course of the nation’s history. This historical perspective points toward both the abiding importance of wetlands for the nation and the need for a policy framework that can assure stewardship of wetlands even in the face of changing political winds. These policies predate the founding of the United States. Colonial authorities made legislative efforts to modify the environment and eliminate negative effects of the original landscape as early as 1685. As arable land along the coast became scarce, the draining of bogs and marshes became a common solution, with some projects covering thousands of acres. Well before the American Revolution, colonial assemblies in Massachusetts, Connecticut, South Carolina, and New York authorized and funded projects to drain marshland to support tillage and pasturage. In 1764, Virginia chartered a private corporation to drain the Great Dismal Swamp. The foundation for regulation of wetlands in the United States is derived through Article 1, Section 8—the Commerce Clause—of the US Constitution, which established the basis for federal authority over navigable waters and gave rise to the concept of “Waters of the United States.” After the ratification of the Constitution, however, state governments continued colonial reclamation policies with little to no modification. During the first half of the nineteenth century, federal government attention focused on westward expansion and settlement, including enactment of numerous land disposal acts and subsidy programs that tended to expose wetland habitats to developmental stress. In particular, construction of the transcontinental railroad required extensive wetland reclamation for right-of-way clearing, as well as consumption of wetland forest products needed for ties, bridges, and fuel. Between 1849 and 1880, Congress passed three Swamp Lands Acts ceding wetland areas “unfit for cultivation” to the states. Because the laws did not carefully define “uncultivability,” they were subject to frequent and opportunistic abuse. Speculators used the laws to privatize almost 65 million acres, much of which was more valuable than had been envisioned under the original swamp land acts. The Reclamation Act of 1902 established the US Reclamation Service to further enable westward expansion and settlement through irrigation projects, water transfer and storage infrastructure, and reclamation of land not easily cultivated. Now known as the Bureau of Reclamation, its “subjugation” of land for human use undoubtedly contributed to the loss of US wetlands. During this era, reclamation activities were enabled by scientific and technological advances such as the invention of blasting caps and nitroglycerine, steam- and oil-powered dredging units, and mass production of drainage tiles. Public perceptions of the role and value of wetlands began to shift during the first half of the twentieth century. After protracted debate, Congress in 1906 passed the Game and Bird Preserves Protection Act, providing regulatory authority for the Bureau of Biological Survey to manage wildlife on designated reservations. The act made it a misdemeanor to disturb birds or their eggs on federal wildlife reservations, including many areas now designated as wetlands. The Migratory Bird Treaty Act of 1918 established federal authority over migratory waterfowl. In addition to establishing protection for enumerated bird species, the act also enunciated the importance of “flyways” and other features of habitat. In the 1920s, hunters and anglers from the newly formed Izaak Walton League organized to fight the draining of large tracts of marsh and bottomlands along the Mississippi River for the creation of farmlands. Drawing on both the observations of outdoor sports enthusiasts and the scientific observations of the day, the league’s president wrote, “The Upper Mississippi bottoms are America’s most prolific spawning grounds for black bass and for all warm water game and food fishes.” Prompted by the league’s urging, Congress in 1925 established the Upper Mississippi River National Wildlife and Fish Refuge. Interestingly, the advent of a protectionist outlook for swamplands is associated with the rise of hunting as a leisure-time pursuit, which in turn was enabled by technological developments such as smokeless gunpowder, choked barrels, and the pump-action shotgun. Even as scientific advances and shifts in cultural value were spurring changes in some areas of government policy, the reclamation imperative continued almost unabated. During the 1930s, the US Department of Agriculture’s Soil Conservation Service supported swamp drainage to jump-start the agricultural economy in response to the Great Depression. Owing to the New Deal surge in water resource projects and agricultural assistance investments, fish and wildlife advocates found themselves often in a defensive posture. In 1934, they lobbied successfully for a Fish and Wildlife Coordination Act, which required resource development agencies to consult with the US Fish and Wildlife Service (FWS) during the planning phase of their projects. Though the act and its later amendments did not require development agencies to abide by FWS findings and opinions, it did result in some on-the-ground measures to minimize project impacts, such as construction of fish ladders and other enhancements to affected habitats, including wetlands. In 1947, The Everglades: River of Grass, by Marjory Stoneman Douglas, was published, with unmistakable social impact. Although the book provided stimulus for designation of the Florida Everglades as a national park, it did so by making the case that the area was a river rather than “merely” a swamp. The period from World War II through the early 1960s was the heyday of federal water control projects. Authorized under laws such as the Flood Control Act of 1936 and the Small Watersheds Act of 1956, the Corps of Engineers, the Bureau of Reclamation, the Tennessee Valley Authority, and the Soil Conservation Service constructed almost 5,000 dams and other water control projects, many of which inundated or otherwise impaired wetlands. Enabled through federally sponsored R&D programs in concrete technology, groundwater modeling, and design of large-scale hydraulic structures, this portfolio of government programs resulted in extensive wetland loss. From 1955 to the mid-1970s, the United States lost approximately half a million acres of wetland habitat every year, most due to agricultural activity. However, advances and consolidation within the fields of wetland science fueled significant changes in public awareness. Indeed, the term “wetland” is a creation of the 1950s, coined partially in response to negative connotations associated with words such as swamp, bog, and mire. Riding a wave of public opinion, Congress in 1972 passed sweeping changes to the Federal Water Pollution Control Act, including provisions requiring a permit for the dredging or filling of wetland areas. Although the Corps of Engineers was tasked with issuance and administration of permits, EPA developed permitting guidelines. In 1977, President Jimmy Carter issued Executive Orders 11988 and 11990, which ended federal assistance for the draining and filling of wetlands in order to avoid or at least minimize destruction of wetland habitat. Another major step in the direction of wetlands protection occurred in 1977, when Congress again amended the Federal Water Pollution Control Act, producing what came to be called the Clean Water Act. Although not articulated in the statute, courts came to interpret the Clean Water Act to include wetlands because they serve as a source of water for US waterways. In 1986, Congress passed the Emergency Wetlands Resources Act, which authorized purchase of wetlands using Land and Water Conservation Fund monies (removing a prior prohibition on such acquisitions) and directed the Department of the Interior, working through the Fish and Wildlife Service, to estimate and compare wetland acreage during colonial times with that of the present-day United States. The FWS inventory determined that of the original 221 million acres, only 110 million remained by 1980. Inventory work was enabled by federal research focused on assessment of wetland processes and functionality, which in turn supported development of wetland classification systems. Outputs derived through research conducted by Lewis Cowardin, Mark Brinson, and others was institutionalized in the form of a National Wetland Inventory. More generally, wetland classification work was supported through access to government-funded drainage statistics, land-use conversion data, hydric soils databases, digital-spatial analyses, and other sources of historical wetlands data. Building on these research activities, the Office of Management and Budget in 2003 released Circular A-16 providing guidance on development and upkeep of a National Spatial Data Infrastructure to include regular updates of the National Wetland Inventory. In 1985, Congress enacted the Food Security Act (also called the US Farm Bill) establishing a “Swampbuster” program to discourage agricultural activities in converted wetlands or highly erodible lands. Critically, the Food Security Act also guided future protection of wetlands through promulgation of field criteria for the delineation of wetlands. A year later, the United States signed on as a party to the Ramsar Convention of Wetlands of International Importance, a decade and a half after its establishment in 1971. The Ramsar Convention calls on parties to recognize the services provided by wetlands and to designate wetland areas of “national significance.” Starting at around the same time, the National Park Service and other resource management agencies began efforts to restore impaired wetland areas within their jurisdictions. Many of these restoration projects included removal of fill material, ditches, artificial levees, and berms constructed as part of earlier efforts to reclaim the very same wetlands. Later Farm Bills adopted in 1990 and 2002 expanded on the 1985 Swampbuster program by authorizing a Wetlands Reserve Program, directed by the Department of Agriculture’s Natural Resources Conservation Service, to help landowners protect wetlands and recoup value lost through subsequent lack of agricultural utilization. By the 1970s most federal policies dealing with wetlands had shifted away from out-and-out reclamation and toward a mix of scientific management, protection, and even restoration. Though never codified in statute, the principle of “no net loss” has been embraced and operationalized by all presidential administrations since George H. W. Bush. Although different administrations have interpreted this policy in different ways, the basic articulation has always honored the premise that wetlands should be protected and, if lost or degraded, replaced through the creation of new wetlands in the same general area. Nevertheless, this policy and management consensus has been subject to challenge through a series of federal court cases and corresponding agency directives addressing the definition of WOTUS under the 1977 Clean Water Act. The 2006 US Supreme Court decision in Rapanos v. United States is especially important because inconsistencies among the justices resulted in confusion regarding the basic applicability of the Clean Water Act. In the late 1980s, a Michigan developer named John Rapanos filled a 22-acre wetland in order to build a mall without filing for a permit, claiming that the property was not a wetland. After an initial guilty verdict, the case moved through a series of remands and reinstatements before being argued in the Supreme Court. Leaning upon a farcically textualist interpretation of the Clean Water Act, Justice Scalia’s plurality opinion sidestepped the corpus of wetland science and characterized the Corps of Engineering’s practice of regulating intermittent waterways as “useful oxymora” and opined that WOTUS should include only “relatively permanent, standing, or continuously flowing bodies of water.” Uncertainty created by Rapanos and other court rulings in turn prompted the Obama and Trump administrations to develop revised interpretations of WOTUS within the context of the Clean Water Act. The press release accompanying EPA’s publication of the Trump administration’s proposed WOTUS Rule celebrates the advent of a “simpler and clearer definition” and asserts that the new policy will result in “cost savings” and “substantial economic growth” and “reduce barriers to business development.” Though clearly aspects of good governance, the imperatives of regulatory simplicity and clarity of application are no justification for policies that are blind to complexity or that assume a world that is different from the state of scientific understanding. For the past two decades, US wetland policy decisions have been founded on a body of research that demonstrates that the connectivity of streams and wetlands is not determined solely by proximity and continuity, but also by overland flows, evapotranspiration, subsurface flow regimes, biological dispersal mechanisms, and other site-specific factors. Whether permanent or ephemeral, wetlands function as sinks for floodwaters, sediment, nutrients, and contaminants that would otherwise affect the condition of downstream waters. The proposed WOTUS Rule seems not to account for the fact that wetlands are dynamic systems that change over time, that the incremental contributions of individual wetland areas can be cumulative across entire watersheds, or that some wetlands are often subject to nondevelopmental stressors such as flooding, erosion, and wave action. Flood plains, wet prairies, forested bogs, mangroves, arctic wetlands, salt marshes, and peatlands differ in terms of soil, surficial attributes, and hydrologic regimes, resulting in different habitat characteristics and thus requiring different management approaches and restoration techniques. The research portfolio makes it clear that wetlands cannot be effectively managed as if they were a set of interconnected surface water features. Although sparsely covered in the popular media, President Trump’s action to rescind Clean Air Act regulations also struck a blow against the scientific management of wetland resources. The March 28, 2017, executive order that rolled back the Obama Clean Power Plan also revoked other standing presidential directives, including a 2015 presidential memorandum that authorized federal agencies to undertake and support the practice of wetland mitigation banking. Wetland banking is key to the operational viability of the no net loss policy because it makes it possible for landowners to restore, create, or protect nearby wetland areas to compensate for wetlands lost or impaired during the course of development. This action portends unfortunate consequences on at least three distinct levels. First, it hampers our ability to manage present-day wetland resources in a rational and efficient manner. Second, it limits our ability to use—or rely on—wetlands as a mechanism to sequester carbon, and hence, help mitigate climate change. And third, it will make it harder for us to restore and replace wetlands likely to be lost or degraded due to the effects of climate change. As the environmental historian Ann Vileisis has written, wetlands have long vexed policy-makers: “Traditionally, land has been considered as private property and water as public property—because wetlands are not only land but land and water, regarding them simply as real property with no other consideration has been a fundamental error in paradigm.” Most of the nation’s so-called wetland policies do not really target wetlands per se, but rather address wetlands in terms of their potential impact on other areas of public value, most particularly clean water and the sanctity of private property. The current regime of policies addressing wetlands is broad, ambiguous, and suffers from inconsistent application, especially if one considers state and local jurisdictions in addition to policies at the federal level. Moreover, many policy initiatives in recent years have been based on executive actions driven by ambiguous legal rulings and not founded on the bedrock of strong and clear statutory language. Yet it is fair to say that if implemented, the proposed WOTUS Rule would constitute a reversal of the historical arc of US wetland policy. Codification of the principal of no net loss, including a requirement for federal agency application and implementation under a defined schedule. In the past, no net loss has been a policy goal, but not a legal requirement operationalized in terms of specific wetland functions. Under such a program, wetland services, not merely acreage, would be expressed in terms of metrics monitored and verified through regular, standardized inventories. Authorization and codification of processes and administrative mechanisms for wetland banking and trading at the federal level. Although at least 17 states or special jurisdictional units (e.g., port authorities, water utilities) provide a legal basis for various wetland transactions, activities on the federal level are cobbled together through biparty memorandums of understanding and other situational agreements that lack a coherent mission and mechanisms for regular congressional oversight. A government-wide program of wetland banking and trading would forge greater consistency and accountability in wetland-related applications. Stipulation of controls over the assignment of wetland oversight to state or local agencies. Similar to EPA’s oversight of state-level air quality and drinking water safety programs, wetland oversight could be granted to states, municipalities, or counties only if they maintain conditions of primacy, such as adherence to nationwide standards, delineation methods, and certifications. This would help to lend consistency and accountability to the management of wetland resources. Continuation of the National Wetland Inventory process, with a mandate for a five-year assessment and reporting cycle. The current inventory cycle is decadal. Reduction in cycle-time would provide improved data and better support adaptive management of a no net loss management regime. Authorization and funding for private-sector and nonfederal wetland restoration. This could be accomplished through existing mechanisms such as the Land and Water Conservation Fund and the National Fish and Wildlife Foundation. The enduring health and vitality of the public’s wetland resources should not be subject to the whims, ideological caprice, or stakeholder relationships that influence the actions of US presidents. Rather, they should be stitched into the fabric of statutory law, possibly through amendment of an existing vehicle such as the 1986 Wetlands Resources Act. Though the current reality of partisan gridlock may dim the prospect for passage of an omnibus wetland protection and management statute, legislation could be crafted to address the needs of a diverse array of stakeholders, including advocates of ecological stewardship; hunters, fishers, and other outdoor sports enthusiasts; municipalities concerned with source water protection; agricultural producers; and landowners and developers. Charles N. Herrick is retired chief operating officer and executive vice president of Stratus Consulting. He is currently adjunct faculty at New York University’s Washington, DC, Center. Richard Andrews, Managing the Environment, Managing Ourselves: A History of American Environmental Policy (New Haven, CT: Yale University Press, 2006). 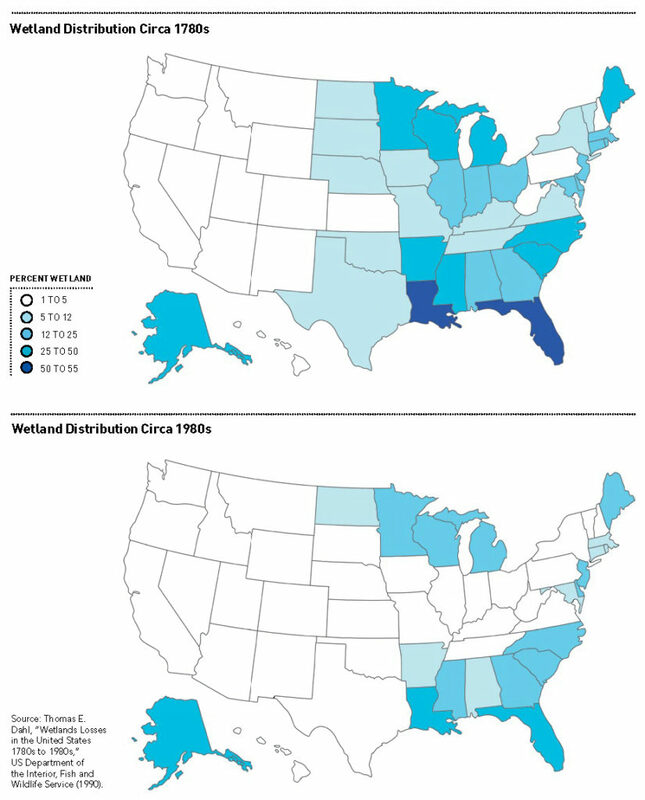 Thomas Dahl, Wetlands Loss Since the Revolution (St. Petersburg, FL: US Fish and Wildlife Service, 1990). Megan Kate Nelson, Trembling Earth: A Cultural History of the Okefenokee Swamp (Athens, GA: University of Georgia Press, 2005). Yasuhide Kawashima and Ruth Tone, “Environmental Policy in Early America: A Survey of Colonial Statutes,” Journal of Forest History 27, no. 4 (1983): 168–179. Ann Vileisis, Discovering the Unknown Landscape: A History of America’s Wetlands (Washington, DC: Island Press, 1997). Anthony Wilson, Swamp: Nature and Culture (London, UK: Reaktion Books, 2018). Herrick, Charles. “Parsing the Waters.” Issues in Science and Technology 35, no. 3 (Spring 2019): 77–83. Previous Article Who Will Set the Rules for Smart Factories?